Listening is one of those things that is consistently an area for growth in my life, both personally and professionally. I’ve written about listening tips before, and I feel fortunate that in my job it’s necessary to practice and hone my listening skills. For me, listening is a combination of presence, patience, staying open, authenticity, and trust. It is about being fully engaged and caring about another person, regardless of whether they’re part of your inner circle, or a presenter at a conference you’ve never met. By listening deeply, you are sharing with that person something incredibly valuable: your attention and therefore your energy. 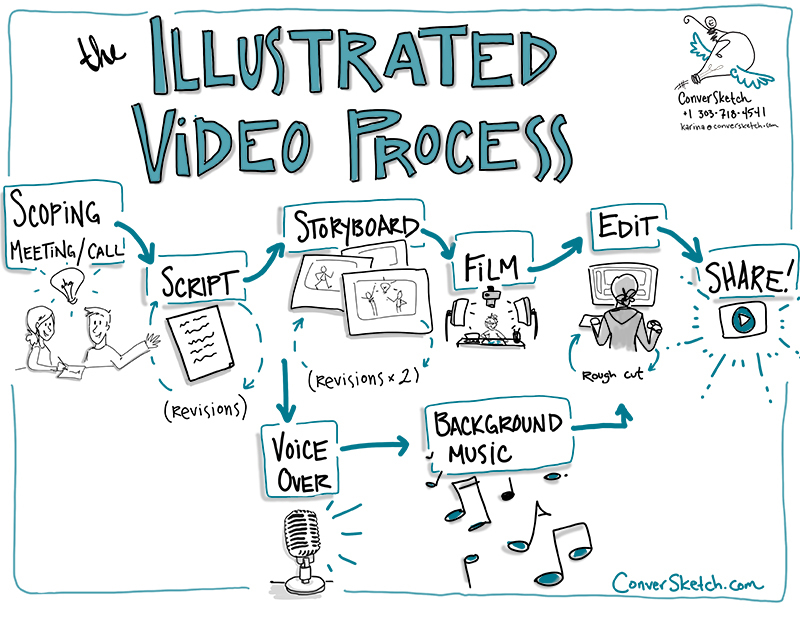 As a graphic recorder, different situations call for different ways of listening. I have known this on a mostly subconscious level throughout my practice, however last month at the Visual Practice Workshop hosted by Kelvy Bird she shared some framing around listening that has shifted the way I approach the work for my clients. Sometimes during rapid-fire presentations, what’s most important is to capture images that reflect the content to help people remember and engage with the ideas. Other times it’s more important to be listening for context and how ideas relate to one another to illuminate systems or relationships. And other times, often over longer periods of time, it’s most important to be with the group as they surface and reveal the “highest potentiality for the systems we serve”. This might be ideas that are fuzzy or still developing, or to be listening for what is not being said. This requires presence, a whole-body experience tuning into not only the mind but also intuition and empathy. Something I love most about graphic recording is that I’m always learning, continually improving. It’s never boring, that’s for sure. And it’s also never perfect. But that’s the wonderful bit about being human, the imperfection keeps things interesting. So here’s to practicing and deepening our listening together. What kind of listening and visual capture can best serve your group? Medellín, Colombia: Next week I’ll be in Colombia for the Intergovernmental Science-Policy Platform on Biodiversity and Ecosystem Services (IPBES). I’ll be working with the Fellows to help them design the future of the program and how to work better intergenerationally as researchers. Looking forward to sharing updates! The Wildfire Research (WiRē)Team Videos Go Live Tomorrow! This video series has been in the works since our kickoff workshop in November, 2016. A collaborative team of social scientists, fire researchers, practitioners and multiple agencies, find out how this team helps communities become more fire adapted (or what “fire adapted” even means!). Here’s the first one for you all as Early Bird subscribers! This week’s blog is going to be fairly straightforward and focused on the in’s and out’s of the video process when I work with clients. Different folks do it differently, and for me, it’s important to be clear about the process and expectations, which I’ll write more about next time. Below you’ll find a sketch of what it looks like to go through the full video creation process with me. Each project and client is different, so we tweak things. But here’s the basic flow, with a few notes below. Script writing responsibility and number of revisions determined with client before project begins. Storyboard revisions again, TBD with my client, but usually I stick with two rounds of revisions on storyboard sketches. Once sketches are approved here, all imagery is FINAL and cannot be changed. Rough Cut revisions include changes to timing, volume, VO, music, color, movement speed, etc. You get the Final Cut and we share that puppy! At this point, you might be wondering how long it takes to create one of these. And the maddening answer I'll give you is...it depends. To give a ball-park, in an ideal world, between 4 and 8 weeks. ...And I'm headed back to Utah tomorrow to spend some time visioning with Deans at the U! More to come!